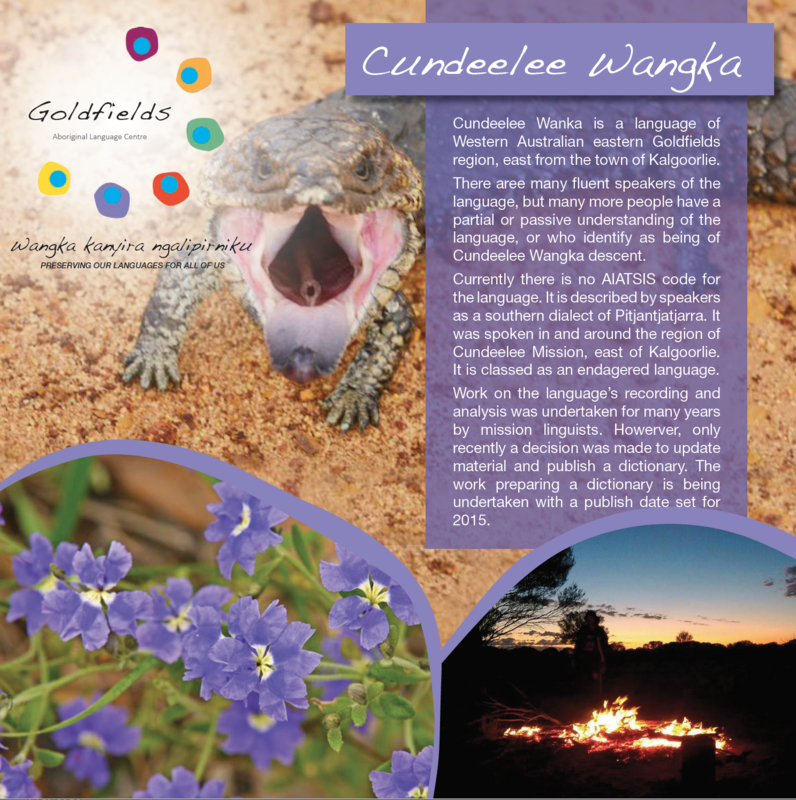 Cundeelee Wangka is a language of Western Australian eastern Goldfields region, east from the town of Kalgoorlie. 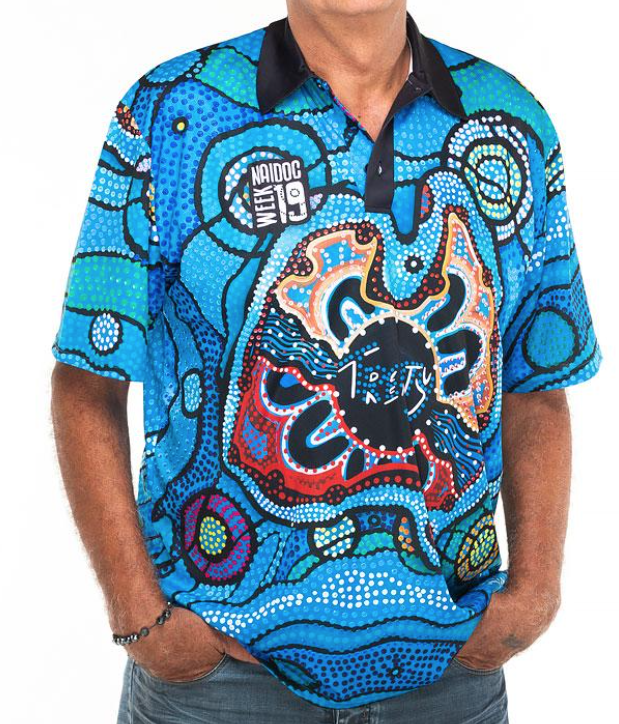 There are many fluent speakers of the language, but many more people have a partial or passive understanding of the language, or who identify as being of Cundeelee Wangka descent. 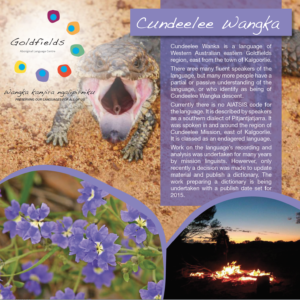 Cundeelee Wangka is a Pama-Nyungan language of the South-West group Ngayarta family. It is a dialect of the Wati family of Western Desert Language along with 40 or so other languages and/or dialects. Currently there is no AUSTLANG coding for the language. The language was spoken at Cundeelee Mission and became an homogenising sub-dialect of probably four other languages. 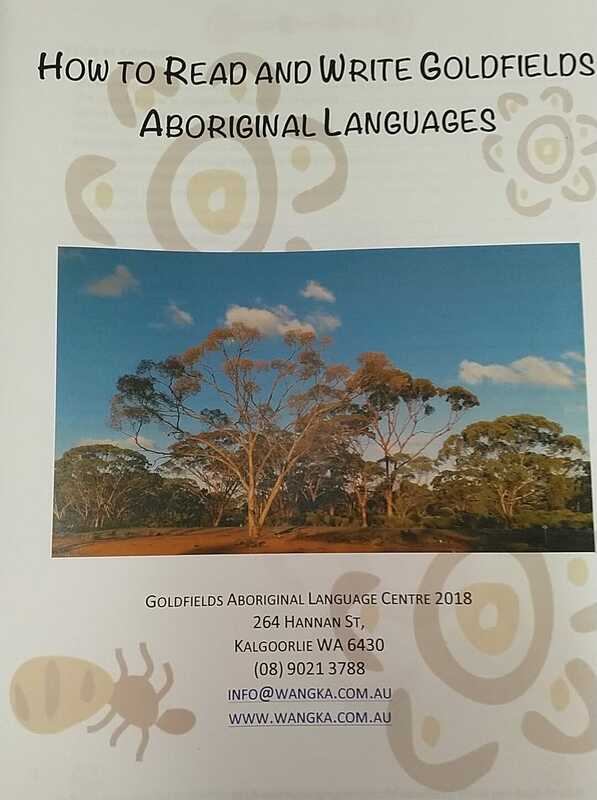 Speakers have described the language as ‘southern Pitjantjantjarra’. It may be a dialect of this language or an Aboriginal creole developed through the mission contact years. 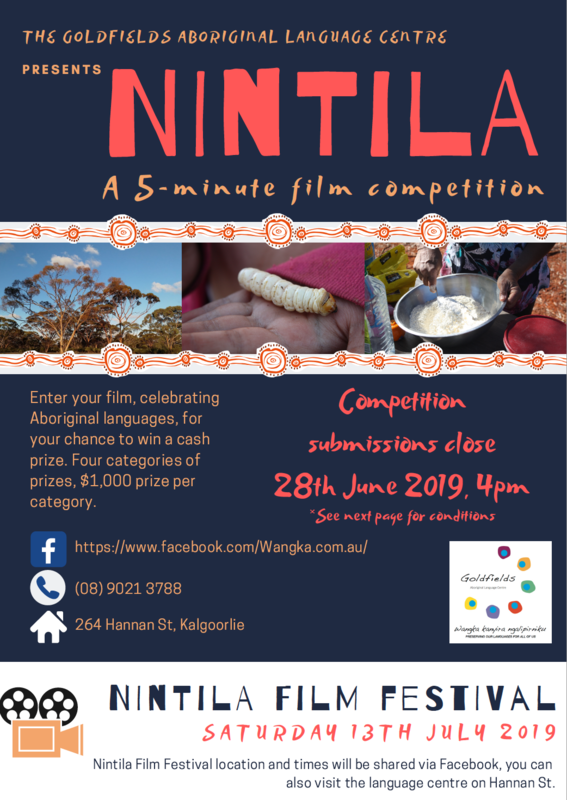 Cundeelee Wangka is spoken by people in the locations of Wiluna, Warburton Ranges, Ernabella, Oldea, Yalata, Coonana, Tjuntjuntjarra and Kalgoorlie. There are thought to be a number of dialects of the language but this needs further research to identify the locations, dialectical differences and features. It may not be possible any more to identify these dialects due to the homogenising process. A dictionary is currently being written in collaboration between Dawn Hadfield and GALC. Stay tuned for the release of this book! 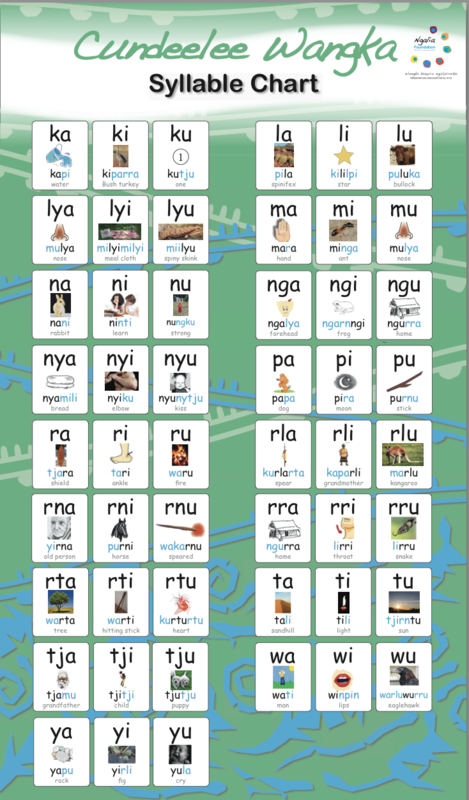 A free downloadable alphabet chart is here. Printed alphabet charts on non-rip paper are available at GALC for $40 each. Excellent for classrooms or children’s rooms, these charts can we wiped and are very strong. A free downloadable syllables chart is here. 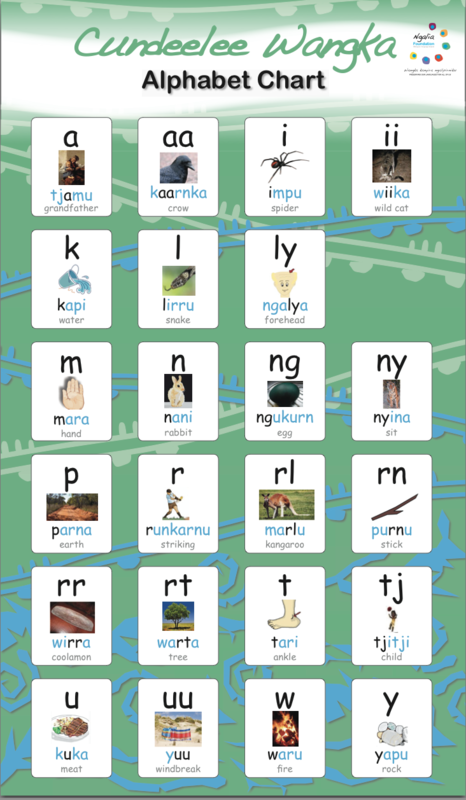 Use this chart to learn how to write Cundeelee Wangka words. Printed syllable charts on non-rip paper are available at GALC for $40 each. Excellent for classrooms or children’s rooms, these charts can we wiped and are very strong.